Scarcely anyone is in the office this week. You know what that means. Where is this post really going? Ostensibly, this post is about Casual Wednesday dressing; so let us praise the pairing of dressy sweaters and dark rinse jeans. and dark purple patent leather flats. What I really want to share with you is my Christmas tree, which my husband, a friend, and I put up this evening. 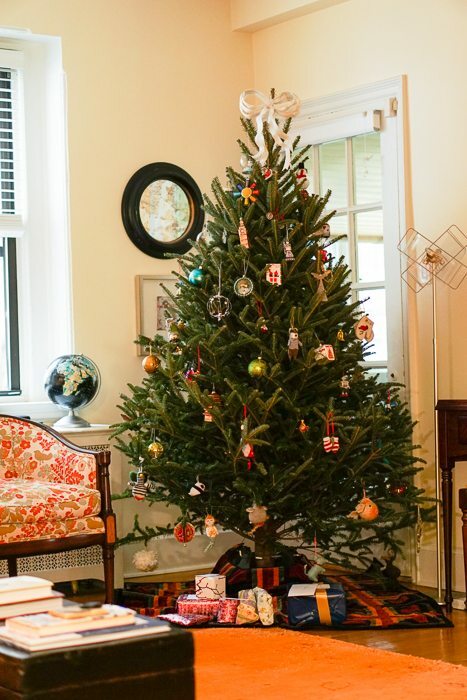 In a moment of precipitous executive functioning, I chose a slightly undersized tree. It’s so hard to gauge the size of a tree when you are outside, in a parking lot, surrounded by trees. But isn’t this tree sweet? We have a ballerina, the cowboy, the robot, a mermaid, and an anxious-looking mouse (who is wearing a waistcoat) fraternizing with a flock of mismatched birds, numerous snowmen, and a couple of Santas. They have a number of vehicles at their disposal (mail truck, taxi, race car, bicycle and train), as well as toys, musical instruments, and food (including a dreidel and Chinese takeout container, which represent my husband’s cultural heritage). The cat is not harmless, whispered Anxious Mouse. 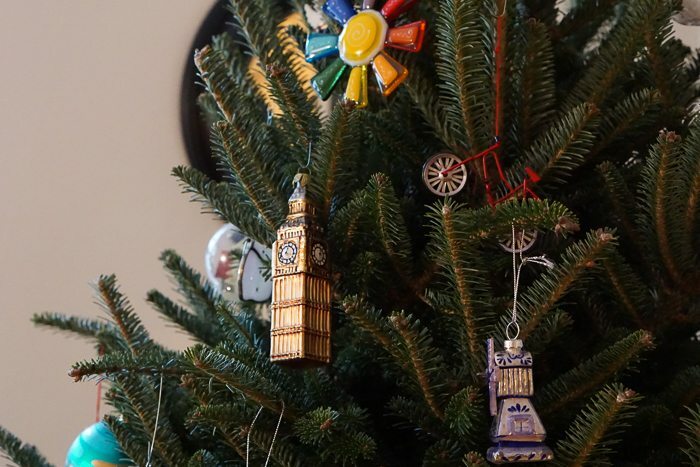 I like to think that this tree will grow at night and the ornaments will come to life and make things lively for Harper and Posy — like some Nutcracker/Toy Story mash-up. 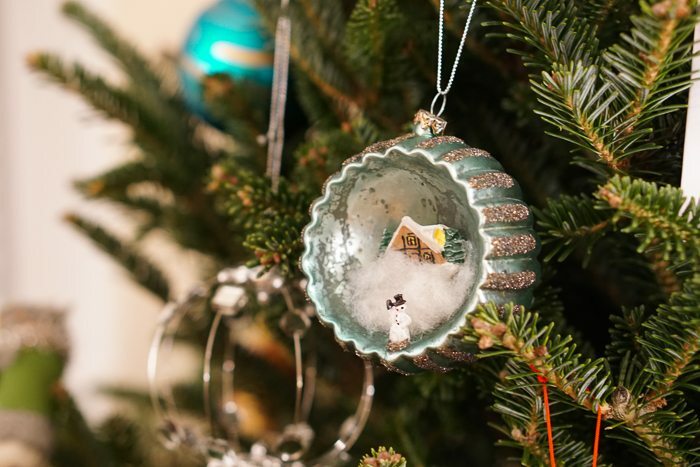 Here is my favorite ornament, which reminds me of the most wondrous ornament from my childhood. 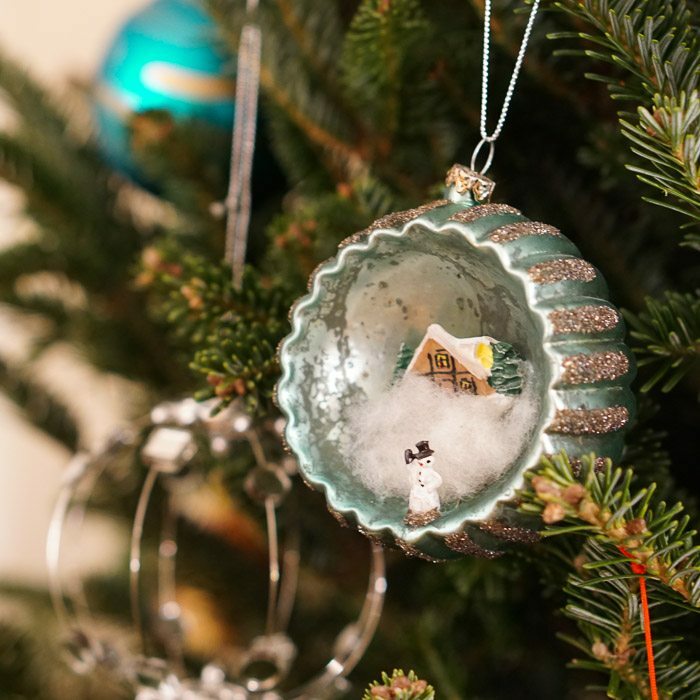 This ornament has everything: iridescence, glitter, and very tiny figures in a diorama setting. Back to the sweater! I bought this sweater from Nanette Lepore a few years ago. So many things to love: the fluted sleeves, the crocheted flower, the ribbing around the waist for shape. The sweater features a cutout that showed a little cleavage, so I have elected to wear it over a very lightweight white blouse. The mandarin collar seems just right; a little presence, without any bulk. As part of my ongoing public education campaign to eradicate misconceptions about leopard print shoes, I’ve put on my leopard print Mary-Janes to demonstrate their versatility. They’re good, right? A very merry Christmas to those of you who celebrate it, and the very best of the holiday season to all. I’ll be off Friday, but back on Monday, December 28th. I definitely woke up this morning and declared, with holiday zeal, that today I would wear jeans to the office as nobody would be there to see or care. I’m happy to know that you agree. Thank you for the thoughtful, delightful posts. I wish you continued grace and creativity in the year ahead! (Also, it is a lovely tree). Happy New Year, MJ! We’ll face 2016 together, and find something to wear . . . Wondrous tree. 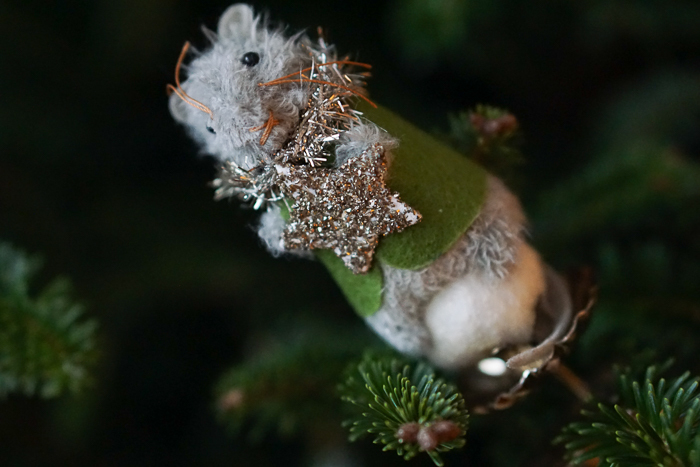 But do you devote the lower branches to unbreakable ornaments the cats can snag, play with and hide under the sofa? That’s an important part of our Christmas (but then, my cats spend so much time hanging out under the live tree they love that a neighbor once accused me of velcro-ing them to the tree skirt to create a kitty Nativity scene). Hi Lynne — Yes! All the soft things (mostly felt ornaments) are down low, arranged in a tempting display. (My thinking is that the cats will be preoccupied with the low-hanging fruit and not attempt to climb the tree.) 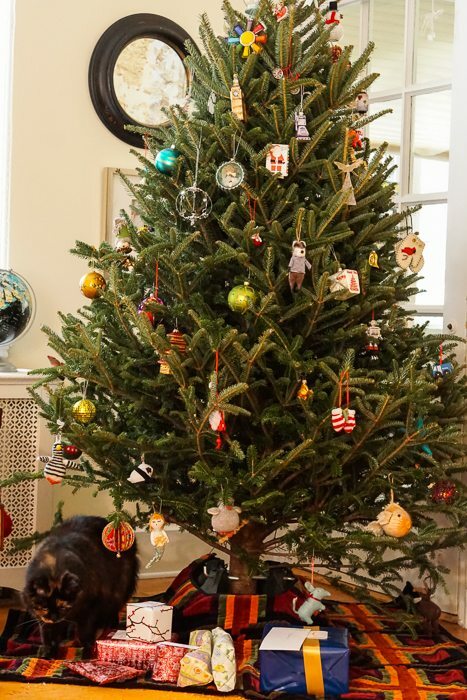 Harper and Posy have camped out under the tree in previous years, and selected one particular ornament for their special attentions — but only Posy has been interested this year, and the ornaments have been unmolested. Are my cats suffering from ennui? My sale-shopping advice is two-fold: (1) don’t buy anything just because it’s on sale and (2) but do look for more expensive things that have been brought into your spending comfort zone by sale pricing. Hope you have a wonderful weekend! 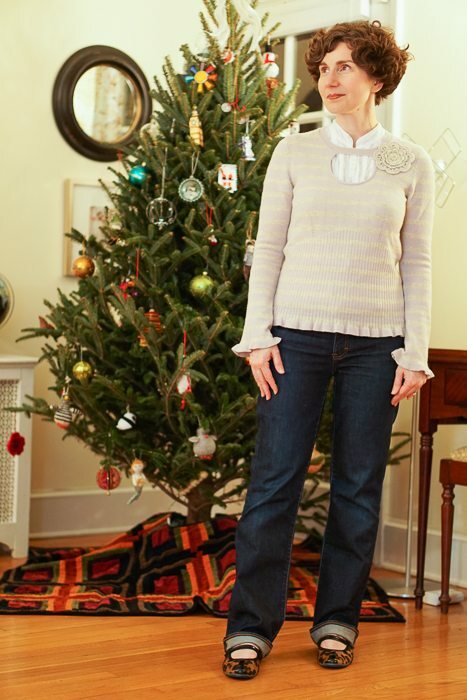 Lovely tree and lovely sweater! Can’t imagine anyone wanting to flaunt some cleavage with that sweet thing. 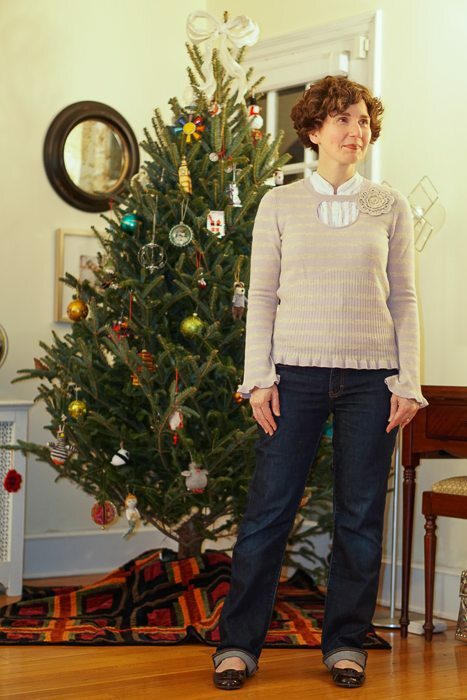 (Sweater, not tree.) The white cotton blouse is just perfect with it. And the Toy Story tree has already achieved perfection. So good to see your beautiful smile! 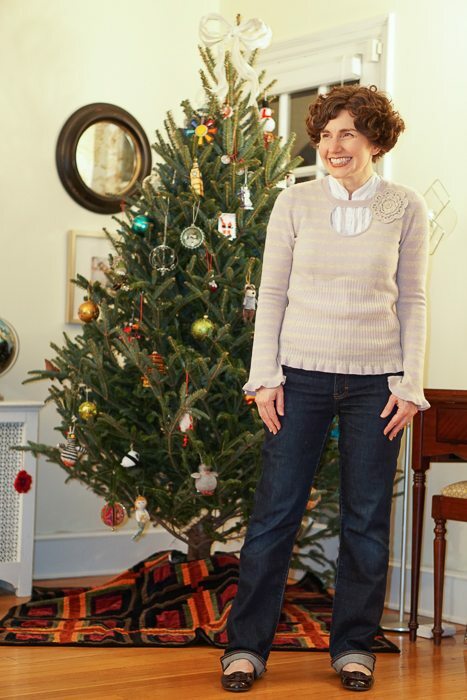 I love the sweater and the tree, especially the dreidel and Chinese take-out box. Also the appearing and disappearing gifts under the tree 🙂 And guess what I’m doing today? Going to the movies with friends, and then out for Chinese food! Happy Holidays!